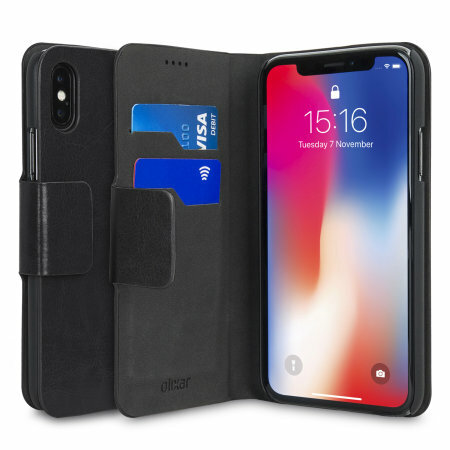 The Olixar leather-style iPhone X Wallet Case in black attaches to the back of your phone to provide enclosed protection and can also be used to hold your credit cards. So leave your regular wallet at home when you need to travel light. Really nice case fits the phone perfectly. Very happy with how it looks donâ€™t put more than 2 cards inside as the edge split with 3 cards I now have cello tape along the edge trying to keep it together! Just cheap tacky and thin . Nothing special at all . In fact I brought a better one off eBay for £3 . Sorry to hear you had problems with this item. Can you please contact our Customer Services team so we can look into this for you. A good product that provides adequate protection without much bulk. Good to protect the phone. Item as described, colour is lovely, very pleased with the service. Quick dispatch and delivery. Excellent product from a great supplier supplier always on time as advised. Fits well, the stand is strong, looks stylish exactly like the pictures. Only downfall is that the screen doesn’t turn on and off when you open and close the case. Please be advised they have not made the iPhone 8 yet, and I have not bought it yet!